There are dozens of weird and mostly unknown dinosaurs in this book. Here is a quick look at some of them. Below is a Troodon, although they call themselves Krekatorians. These are the intelligent race that lived 65 mya, and many brave explorers from this species are searching through time to try and find a new time to colonize. They are not very large, only four to five feet tall, nine feet long, and weigh in about 100 pounds. What they lack in size, however, they make up for in brainpower. Their technology makes humans look like chimpazees banging rocks and sticks together. Rhabdodon, or Donetics, as called by their owners, the Krekatorians, are the most common domesticated animals that the Krekatorians use in their daily lives. Donetics are larger than their masters, about the size and weight of a cow. Their intelligence is comparable to a cow as well. They are used as draft animals, to pull large loads in rural communities. They are also used for food and for company. Kra e' tac owns one, a female named Kix. 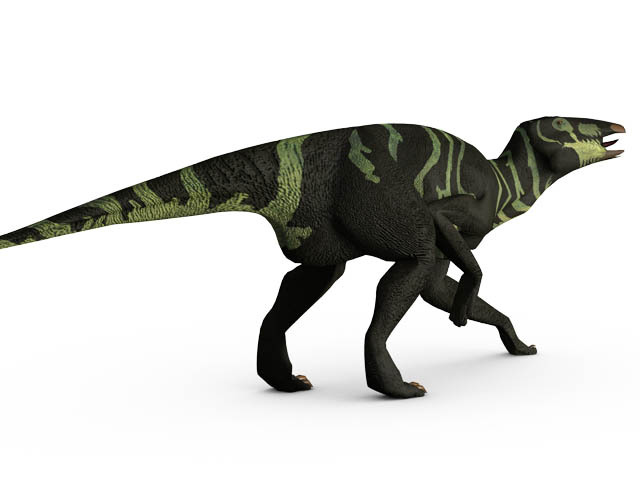 Referred to as "Megabills" by the Krekatorians, Edmontosaurus is a large, duck-billed dinosaur. 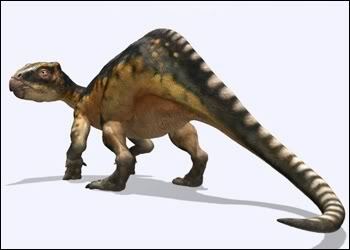 One of the most common dinosaurs in Kra's time, they were a huge part of the stone age Krekatorians diet, making up about 85%. Every year, a team of Krekatorian hunters come together to bring down a Megabill in the Cagmat, a sacred hunt in honor of their ancestors. Strangly, megabill numbes have dropped recently.